Participants are required to attend all workshops of the course. September 24th for the yearly participation. For one course: on the day of the course. Yearly participation has to be paid in 3 amounts of 150€ (before the September, November and January courses). The Special Courses are the initiative of Godalkanje.org open source music education in Slovenia. It is a part of the One Music Society activities that are orientated towards sound ecology, equal rights for different music styles and run new economy experiments with music production. In Slovenian, ‘godala’ means ‘bowed string instruments’. Godalkanje courses take place since 2010 with the intention to present as much diversity as possible in order to give string players a lot of opportunities for further investigation. 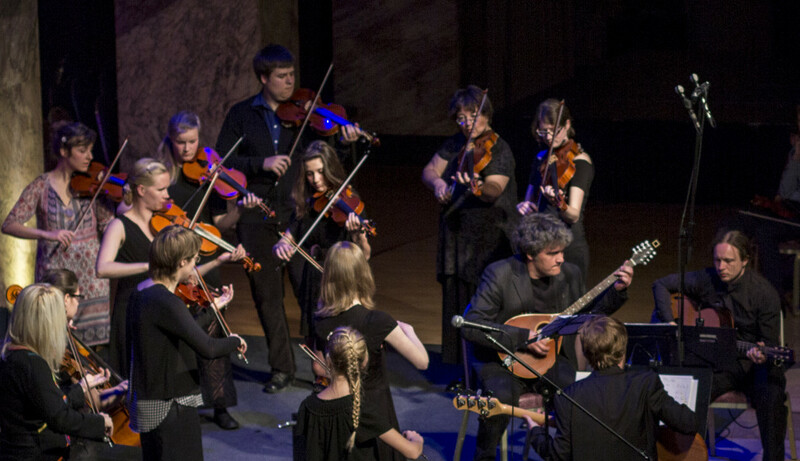 As the founder Bojan Cvetrežnik said, he only found how diverse European violin music is after having worked as a violinist-soloist in Cirque du Soleil, as a principal viola player in the Slovenian National Opera Orchestra, as a member of the BBC awarded progressive group Terrafolk and as the founder of Symbolic Orchestra. Each major violin folk movement (Celtic, Scandinavian, Balkan, Slavic, Romanian, Latin, Alp region…) has hundreds of different violin styles inside, even on very small territories. If we add this to hundreds of years of written music in classical music, traditional and contemporary jazz violin, rock and electronic music, it would be extremely difficult to find a better symbol for the European musical diversity than the violin is. Of course viola, cello and bass are also commonly used, as well as other bowed instruments (nyckelharpa, kontra, early music instruments…). The courses are mostly run by playing ‘all together’ and with a strong intention to perform publicly as soon as possible, not excluding all the opportunities given by Ljubljana architecture. A smaller group of participants uses the repertoire of the courses for group playing or performing with their groups outside Special Courses. All fears about how the integration with the new worlds will turn out must immediately be eliminated. That was proved too many times to still doubt about it. All different, all equal. If there are doubts about the level of younger players please contact us and we can arrange a Skype meeting; or send us a video recording of playing at the recent level.